The scenario is claustrophic: in medieval England, Sarah, a seventeen-year-old virgin, relinquishes worldly life—family, human touch, comfort, light, fresh air—and is locked into a tiny stone cell attached to the village church. It is voluntary. And it is permanent. The door to the cell, or anchorhold, is nailed shut. Sarah conceives of this as ‘the nailing of my hands and feet to the cross with Christ’ but an equally fitting comparison would be the nailing of a coffin, because the anchorhold is to be Sarah’s home and also her grave: lest there be any doubt, she is told that the bones of a previous anchoress, Sister Agnes, are interred beneath her. Her life’s work is to devote herself to prayer—for the edification of the village and the soul of the wealthy landowner who is her patron. I was sent a copy of Robyn Cadwallader’s debut novel in preparation for a session I was chairing at the Perth Writers Festival. As someone who has trouble with confined spaces, and has nightmares about being buried alive, I felt a little uneasy when I held the book in my hand, knowing the situation of its protagonist. The stunning cover illustration, a swallow soaring upwards, should have been a clue, should have reassured me. Because this novel soars, too. Sarah’s isolation from the world is not as complete as I had originally feared it would be. She has two female servants who attend to her (extremely meagre) needs of food and clothing and cleanliness (such as cleanliness was in medieval times) through one window. Another window allows her to receive female villagers seeking her counsel. A confessor from the nearby priory comes once a month to hear her sins, and to interpret her written Rule. Charmingly, a cat visits through the servants’ window whether Sarah likes it or not, occupying the best place by the fire. And she can partially see, through a narrow slit in the stone wall called a ‘squint’, into the church. Cadwallader, also a medieval scholar, convincingly creates a world outside the anchorhold that is patriarchal, class-based, punitive, predatory (for women) and austere. Sarah escapes that physical world but not, of course, these defining elements; they continue to shape her existence in every way. While I found her occasional displays of self-loathing disturbing to read (particularly those involving physical mortification—self-flagellation and the wearing of a hairshirt), I could understand them in the context of her time and circumstance. For a work whose central premise is the act of ‘enclosure’, a determined, purposeful isolation of the self from the world, The Anchoress is a remarkably sensual novel. But perhaps this is not so surprising, because the act of isolation requires a constant repudiation of bodily desires of all kinds. Sexual desire is the obvious one (Bishop Michael tells her, ‘Enclosure is the only means by which your virginity may be assured’ and warns her that ‘Lust prowls, it prowls’), but Sarah and her confessor also speak of ‘keeping the flesh in need’—meaning in need of food, warmth, soft bedding, external stimulation. The narrative dwells in the intimacies and minutiae of deprivation and what passes as compensation. For example, with limited visual stimulation, Sarah’s other senses are heightened. The stewed meat smelt rich; the fragrance wound around my head and sank into my clothes. The squeak of metal close by, the sound of wood on wood as the church door shut. The smell of dirt floated in to me as it always did when someone entered the church. Muffled footsteps, a few soft thumps and then quietness. The cough of a sick man, dry and rasping, the sound of breath dragged in and out. I had been intrigued, at the outset, to see how Cadwallader would create drama and pace in the story of this voluntarily entombed character, but it soon became apparent that there was rich potential for both. First, Sarah has a history, a back story, a reason for the extreme choice she has made. In the interests of avoiding spoilers, I don’t intend to say more about that. Second, although much of the narrative takes place in a cell, that cell is attached to a church, and the church is located in a village, and the village is connected intimately with two sources of significant power—the Catholic Church, in the form of the priory, and the land-owning class, in the form of Sarah’s patron; they, in turn, are intimately connected with each other. There is a strong character arc in the novel in relation to Sarah that could be described as a unique coming-of-age story. And there is are narrative arcs involving the wider world—Sarah’s family, her servants, the villagers, her confessor, her patron, the prior and brothers, the previous anchoresses—to which Sarah is central. The Anchoress unspools its threads at a pace that feels entirely consonant with the world it inhabits, but it never falters, is never less than compelling. Good historical fiction tells us something about our own world as it narrates a story of the past. While reading The Anchoress, I was struck time and again by the operation of power along gender and class lines. While these play out in the most extreme ways in the novel, I could not help but think of the residues of powerlessness that still exist today, and of the ways in which people resist, fight back, reclaim, endure, create. Or fail to. I think it is one of the greatest gifts of fiction that it increases our empathy for the other, our understanding that the other is ourselves. The Anchoress is a novel that I know I will continue to think about for a long time—and that’s my kind of fiction. 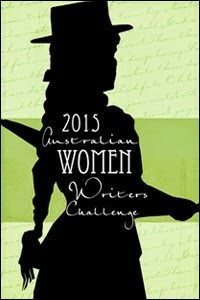 This review counts towards my total for the 2015 Australian Women Writers Challenge.